Twitter, the microblogging site that allows people to share information and discussions in 140 characters or less, has been a fixture in social media for quite some time. However, new advancements to the site are always being thought of and sometimes made in order to keep up the site fresh and ahead of the curve. One of those recent changes has been the addition of “Nearby” tweets. 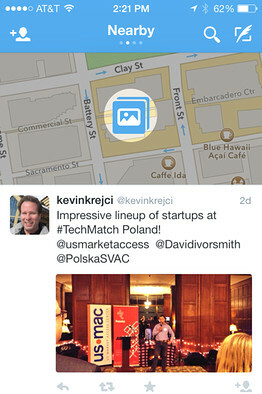 Found on it’s mobile app, “Nearby” provides users tweets of other nearby users, whether you follow them or not. The “Nearby” timeline will appear for people who allow Twitter to see and use their location in a manner similar to Foursquare. People have been able to add their location to tweets since 2010, but the feature is turned off by default and must be turned on manually by the user to be effective. So if you’re wondering what’s going on around the corner or why some major event is happen in your city, “Nearby” will become completely useful to you because you can see what other Twitter users are posting. By organizing millions of tweets and making them relevant to the users at hand, Twitter is potentially making “Nearby” a profitable marketing tool to local business and/or advertisers. They could use “Nearby” to market any number of their services through the social media portal in real time and target people in designated areas due to the mapping technology. This technology, combined with it’s social adequacy and cookies based retargeted ads program, could prove to be what resonates with advertisers, marketers, and consumers alike. If it catches on, it could prove to be a win-win for everyone.